Evergreen wood fern stays green year-round. Look for it in damp wooded areas with rocks or at the base of a tree. Its leaves come up in a circle, as shown. What stays bright green in our November woods and throughout the winter? Hint: it’s not an evergreen tree or shrub. Not moss, either. Would you believe it’s a fern? Call it evergreen wood fern, fancy fern, or intermediate wood fern (Dryopteris intermedia) – it’s a wood fern with lacy, delicate-looking leaves. When most ferns are the color of caramel or have faded to pale yellow, thanks to cold temperatures or frost, evergreen wood fern stands out in vibrant green. Look for it in damp areas with rocks, or at the base of a tree. Evergreen wood fern’s leaves, or fronds, usually grow 1-3 feet long. They come up in a circle from an underground rhizome (underground stem). At this time of year it’s easy to spot evergreen wood fern and to tell it apart from other ferns because it’s the only one that’s summer green. The same is true in winter and early spring, when you’re likely to see its green fronds flattened on the ground, sometimes still partly covered with snow – an odd sight. How does this fern stay green when most other vegetation is dying back or losing its leaves? For starters, the fern’s habit of being flattened by bad weather or snow is helpful. When the green fronds are on the ground, warmth from the earth keeps them warmer than they would be if they stood up in the wind and cold air. The fern’s stems weaken near the ground in autumn, helping the fronds to fall over. When snow comes, it acts as a blanket and insulates the fronds from frigid air above. But that’s not all. This fern, like other evergreen plants, produces substances that act as antifreeze. As the days shorten and temperatures cool, evergreen wood fern is prompted to move sugars into its leaves, as other evergreen plants do, instead of storing them all below ground in roots or rhizomes, as plants that lose their leaves do. The concentration of sugars in the leaves acts as a kind of antifreeze that protects the leaves from freezing when temperatures are 5-10 degrees below freezing. We see a similar antifreeze effect in seawater, which freezes at 28 degrees (F), thanks to all the salt dissolved in it. In contrast, fresh water freezes at 32 degrees (F). What happens at even lower temperatures? Again, as days shorten and temperatures cool, evergreen plants also produce another kind of antifreeze. They make special proteins, known as anti-freeze proteins (AFPs), which interact with water to prevent ice from starting to form or to prevent tiny ice crystals from growing larger and damaging plant tissues. These antifreeze proteins are similar to other proteins that plants produce to resist snow molds and other organisms that can infect plants at low temperatures. Some insects and fish also make antifreeze proteins that help them survive winter temperatures. The food industry uses antifreeze proteins to keep ice cream smooth, especially when it melts and refreezes in home freezers. Because evergreen wood fern stays green in fall, winter, and early spring, it is able to continue photosynthesis – making sugars – throughout the year. Doing so gives the fern an early start in the spring growing season, when other plants first have to grow new leaves. You might think that green leaves in winter would be tempting food for hungry animals and insects, but most animals avoid eating ferns at any time of year. Fern leaves typically contain chemicals that animals avoid. When the woods are green in late spring and summer, it’s not so easy to tell the difference between evergreen wood fern and many other similar-looking ferns. One clue, however, is that evergreen wood fern’s leaves are “thrice cut” or triple-cut, meaning that they divide into leaflets three times, giving the fern its very lacy look. In other words, a frond has leaflets (first cut) which in turn are divided into leaflets (second cut), which are even further divided into leaflets (third cut).This triple cut gives the fern its name of fancy fern. Most other wood ferns (Dryopteris) are only “twice cut” or double-cut, so they don’t look quite so lacy. But back to autumn. While walking in our local woods at this time of year, you might notice a couple of other ferns that are green – but a shiny, dark Christmas-tree green. Their leaves are waxy, and definitely not lacy. The more common of these two is Christmas fern (Polystichum acrostichoides). It is once cut, with boot-shaped leaflets (like Santa’s boots) on its fronds (see Nature Notes of 12-10-2004). 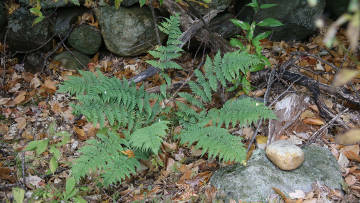 The other dark green fern, known as rock cap fern or rock polypody (Polypodium virginianum), looks like a small version of Christmas fern and tends to grow on top of boulders. Both stay green year-round. Enjoy looking for green in November and in the winter woods, and think of the amazing ways in which life manages to survive the cold and drought of New England winters.